Tourists flock to the Yalong Bay Tropical Paradise Rainforest Park during New Year holiday. Sanya is seeing tourism booming during the longer New Year holiday with tourists flooding into the city’s major scenic spots. 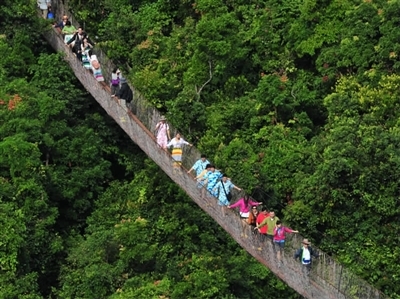 The number of travelers to Tianyahaijiao Scenic Spot has been increasing daily since the holiday started. On Monday alone, more than 10,000 people visited the Tianjiahaijiao. Because of the long holidays, trips of up to six days are not only attracting mainland visitors but also island visitors. Travel agencies have offered many interesting short-term tour products targeted at the local group. Hotels in Sanya have also seen occupancy levels booming due to the increase of tourists during the holiday. Major star-related hotels in Sanya Bay, Yalong Bay and Haitang Bay have hotel occupancy rate exceeding 80%. Besides the domestic tourists and family groups, MICE tourism is another factor pushing up the numbers of tourist arrivals.